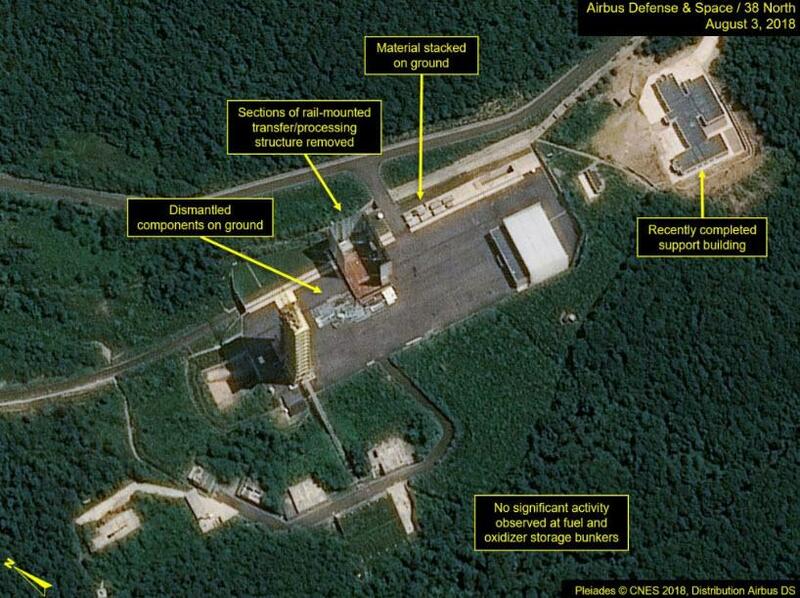 North Korea Nuke Launch Site Dismantling Progress "Goes Beyond Summit Commitment"
Amid desperate attempts by the neocons and their media lapdogs to disparage President Trump's agreements with North Korea's leader, claiming Kim is violating the terms, 38North has confirmed that not only is progress being made on dismantling its nuclear missile launch facilities, but "activity at the launch pad appears to go beyond that commitment." As we previously noted, these stories of supposed North Korean betrayal by NBC, CNN, and the Wall Street Journal are egregious cases of distorting news by pushing a predetermined policy line. But those news outlets, far from being outliers, are merely reflecting the norms of the entire corporate news system. 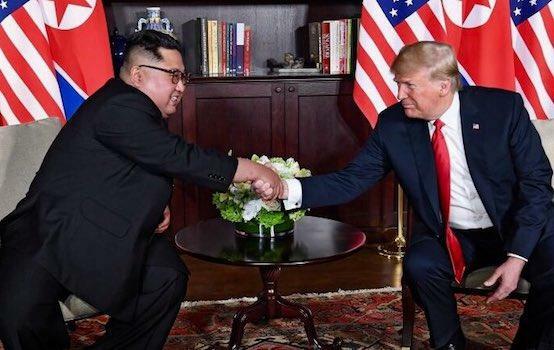 The stories of how North Korea is now violating an imaginary pledge by Kim to Trump in Singapore are even more outrageous, because big media had previously peddled the opposite line: that Kim at the Singapore Summit made no firm commitment to give up his nuclear weapons and that the “agreement” in Singapore was the weakest of any thus far. That claim, which blithely ignored the fundamental distinction between a brief summit meeting statement and past formal agreements with North Korea that took months to reach, was a media maneuver of unparalleled brazenness. And big media have since topped that feat of journalistic legerdemain by claiming that North Korea has demonstrated bad faith by failing to halt all nuclear and missile-related activities. Which makes today's news from expert satellite imagery analyst Joseph Bermudez Jr even more notable. Commercial satellite imagery from August 3 indicates additional dismantlement activities are ongoing at the Sohae Satellite Launching Station since last observed. 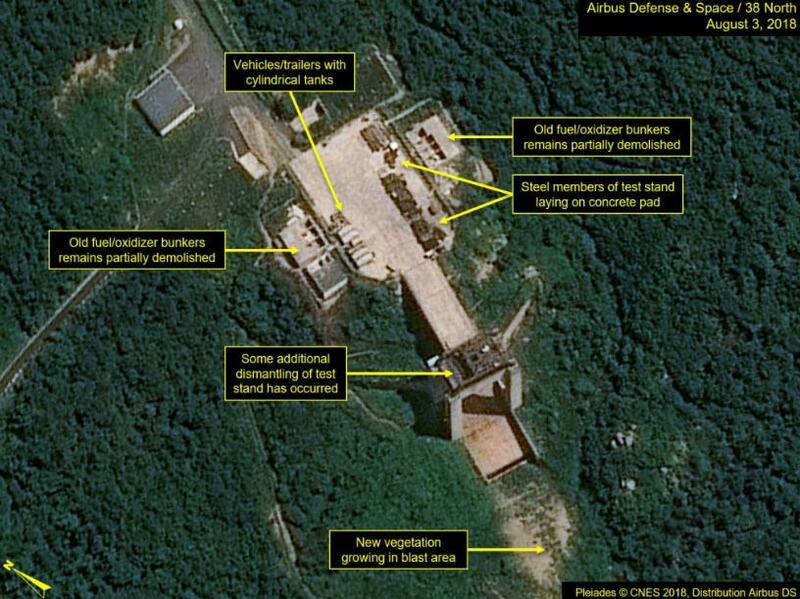 At the vertical engine test stand, used for testing and development of engines for ballistic missiles and space launch vehicles, the North Koreans have continued to tear down the steel base structure and appear to be removing fuel and oxidizer tanks from dismantled bunkers. At the launch pad, work on the rail-mounted processing/transfer structure used to support rocket launches continues, with two-thirds of the west wall and a third of the north wall having been removed, and its components remain on the adjacent ground. While the launch pad activity seems to be related to dismantlement, as it stands right now, we cannot rule out the possibility that it could be the beginning of a project to modify the structure for other purposes. While dismantlement of the vertical engine test stand represents a fulfillment of Chairman Kim’s agreement with President Trump conveyed publicly during the post-Singapore Summit press conference, activity at the launch pad appears to go beyond that commitment. These activities, however, must be viewed cautiously as “first steps” since neither are presently permanent or irreversible. The demolition of the test stand’s concrete foundations, launch pad’s gantry tower, pad foundation and exhaust deflector, etc., would represent more permanent and irreversible actions as there is no known facility with equivalent capabilities elsewhere in the country. The coming months should provide more firm indications whether these are indeed the “first steps” in reducing the North Korean ballistic missile threat. As we concluded previously, a media complex so determined to discredit negotiations with North Korea and so unfettered by political-diplomatic reality seriously threatens the ability of the United States to deliver on any agreement with Pyongyang. That means alternative media must make more aggressive efforts to challenge the corporate press’s coverage... and today's news seems positive (but we will see what spin it gets).